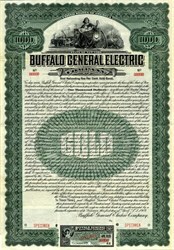 Beautiful engraved specimen $1000 Gold Bond Certificate from the Buffalo General Electric Company dated in 1909. This historic document was printed by American Bank Note Company and has an ornate border around it with a vignette of an allegorical woman with a child. This item is over 107 years old. 60 coupons on top. The following was written for the Pan-American Exposition held in Buffalo, New York in 1901: The history of The Buffalo General Electric Company is largely the history of the electrical development of Buffalo in the past twenty-five years. In 1882, James Adams, A. P. Wright, J. F. Moulton, and H. G. Knowlton formed an organization for the purpose of distributing electric light in the city. The Brush Electric Light Company and to The United States Electric Company, but the progress of the electric companies was exceedingly slow, and they met with all sorts of difficulties in establishing their business, ignorance and prejudice being always potential factors. The early efforts of the company were confined to what was then known as the First Ward and the outlying districts, for the reason that it was not an easy matter for the existing lighting organization to address themselves to the illumination of streets in other quarters. Much criticism was made by individuals and a hostile press because such streets as Abbott Road and Elk Street were lighted by electricity, alleging that it was farm land and not recognizing that the lighting was essential to these great highways for those who came into the city with their goods in the early hours of the morning. But the criticism was upon so flimsy a basis that it could not stand long in the light of use and appreciation. In 1886 an organization was formed known as The Thomson-Houston Electric Light Company, which, in the main, purposed to do electric lighting on the west side. The results of the business of both companies was not entirely satisfactory, and a combination of interests, by the purchase of stocks and bonds of the respective companies by a common holder, was entered into in 1892 under the name of The Buffalo General Electric Company. The active elements of all the companies were associated in the new organization, with Mr. Daniel O'Day as president, Mr. George Urban, Junior, vice-president, and Mr. Charles R. Huntley general manager. From that time on there has been a steady increase in the use and appreciation of electricity. In 1897 the steam plants of the various companies were gradually dismantled and the power was taken from Niagara Falls through The Cataract Power and Conduit Company. Today Niagara Falls power is distributed through The Buffalo General Electric Company and is probably the most potent factor in Buffalo's industrial life. At the present time there are different distributing stations in different parts of the city�in Wilkeson Street, Court and Main streets, Ohio Street, Babcock Street, and Ferry Street. In Buffalo the use of electricity is becoming general, and the community is living up to its name�the Electric City. Particularly is the application of this force to all domestic requirements becoming popular; such as for house lights, heat for cooking and laundry purposes, for operating sewing machines, mechanical elevators, and so forth. The Buffalo General Electric Company has been the leading educator in this respect. The offices of this concern are located in the new Fidelity Building, and the present officers are: president and general manager, Charles R. Huntley; vice-presidents, George Urban, Junior, and Andrew Langdon; assistant manager, William R. Huntley; treasurer, D. T. Nash.